Mini's special edition cars have always been a little silly, but they have a huge parts bin to rummage around in for accessories. However they look, they are actually different. Now they're trying to make their next special car more, um, special, by asking you all which one they should build 56 of. 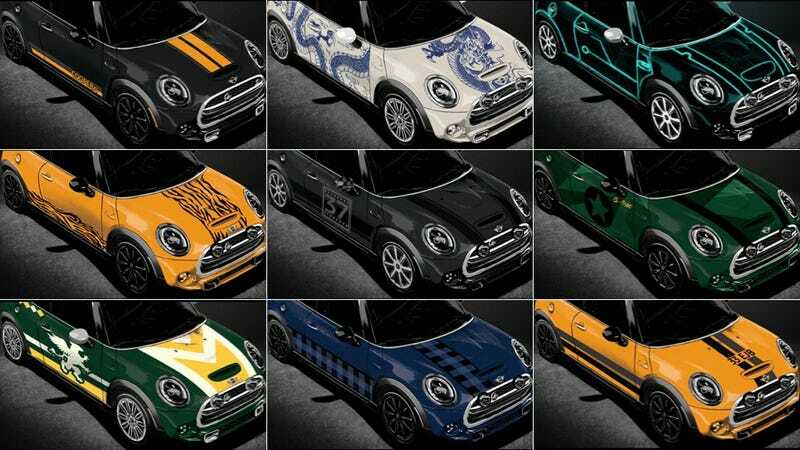 Out of a contest to be among the first to drive the 2014 Mini Cooper, 10 people were able to build their own hatch online and put it up for vote. Personally, I'm partial to "Monte," done to honor the Mini's first Monte Carlo Rally win in 1964. Since it's been 50 years since that event, it's pretty worthy of a special edition. But all of these are better than a "special edition" that only has a chrome badge and some contrasting-colored stitching on the seats. Hurry up and vote, though. You only have through Wednesday to make up your mind.